Farmhouse sinks are a becoming increasingly popular and are found in many Yardley area homes. These sinks have plenty of space and are ideal to wash pots and pans. They are traditionally designed to fit custom cabinetry and are installed under the kitchen countertop, so you can easily wipe crumbs into the sink. These sinks come in a variety of materials including stainless steel, copper, fireclay, and cast iron. For a unique look or to use the sink as a focal point, consider sculpted metal. This transitional kitchen design in Yardley includes a sculpted metal sink at the wet bar, which gives the space added texture and dimension. Do you love to cook? Then why not add a great chef’s sink to your kitchen setup. This Yardley kitchen design includes a sink complete with a drain board, colander, drying rack, and a pull-down faucet – the perfect combo for both your veggie and dish cleaning needs! When it comes to kitchen organization, it seems that there is never enough space to store all your food, gadgets, and supplies. Thoughtfully crafted storage can improve the shape and function of your kitchen design. This stunning kitchen includes a walk in pantry with shelving and storage for pots, pans, gadgets, and food. Each cabinet and drawer has specialized storage for everything from flatware to spices, cutting boards, pans, and alcohol! Color is making a huge come back in everything from appliances to kitchen cabinets. 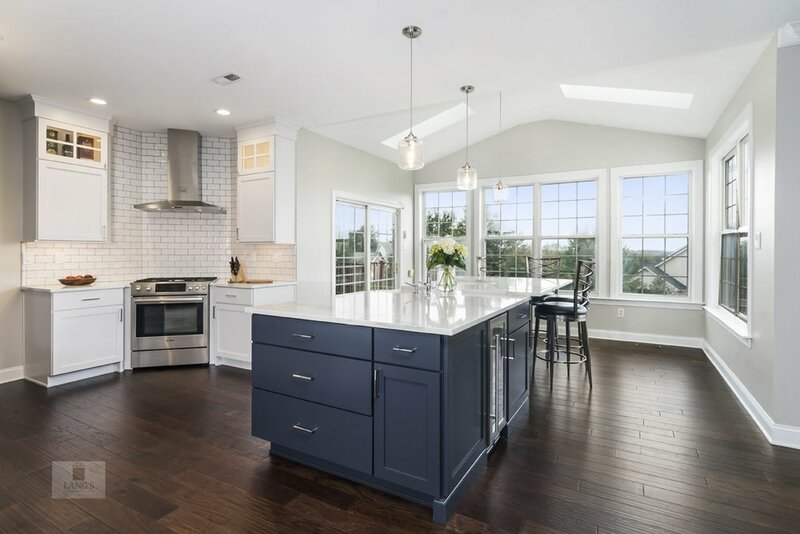 This beautiful kitchen features blue island cabinetry, which is enhanced in the natural light and is a perfect contrast to the bright white perimeter cabinets. While the Yardley kitchen design pictured below has blue island cabinetry paired with warm wood finish perimeter cabinets. Glass front cabinetry creates more space and dimension, making the room feel bigger. This timeless option is easier to clean than its wood counterparts. It’s also a great way to show off colorful dishware, fancy glasses or other personal items. The beverage bar below left features glass cabinetry; while the kitchen below right has glass front kitchen cabinets in the main space and bar area along with a mirrored backsplash to show off beautiful glassware. A tile backsplash offers homeowners a dual purpose: it acts as a protective shield, stopping food stains and grease from damaging the wall, and it adds flair and dimension to your kitchen renovation. This kitchen is a wine lover’s paradise and features and incredible backsplash with wine corks, provided by the homeowner, inlaid into the tile. A herring-boned decorative tile is strategically placed above the stove in this Yardley kitchen design, creating an intriguing focal point. Residents of Yardley love to entertain. 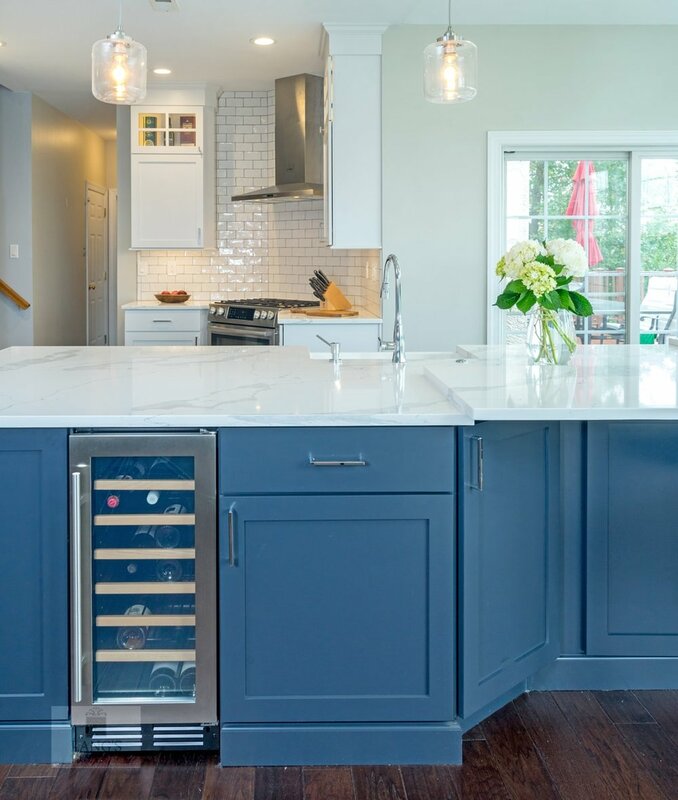 If you need some evidence, check out these beautiful kitchen designs complete with deluxe beverage bars equipped with wine refrigerators to keep your Chardonnay at just the right temperature! In this spacious blue and white kitchen, the island is home to loads of storage, including a narrow wine fridge, which holds an ample supply of wine and other drinks. 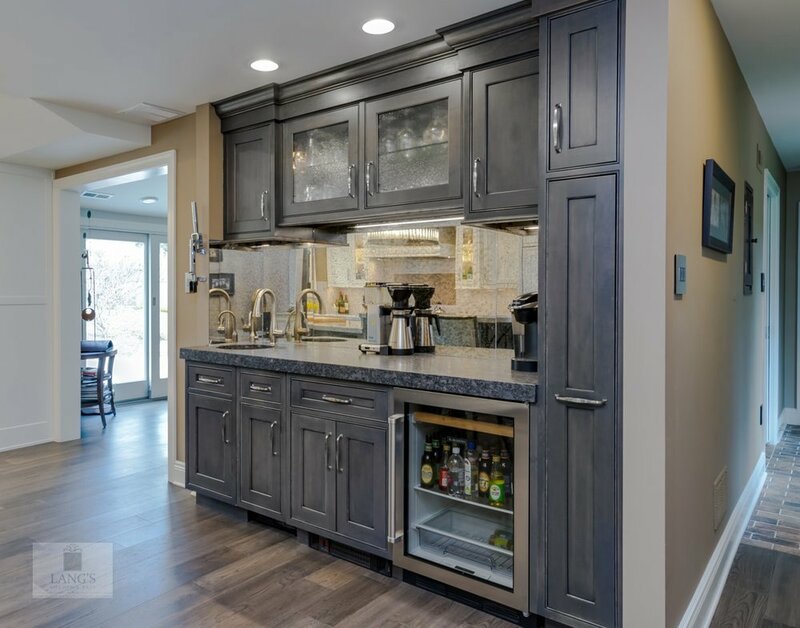 This Yardley kitchen includes a full beverage bar with a beverage refrigerator and plenty of storage. Lang’s Kitchen & Bath has worked with homeowners in Yardley for 40 years. Our team is knowledgeable about popular and local trends, sourcing local materials, and can work with you whether you’re looking to maintain elements of your historic Yardley home or transform your existing space into a modern oasis. 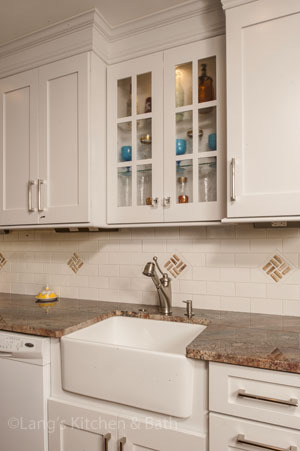 Call us today at 215-968-5300 to start your kitchen renovation!